This grim forecast from 1995 has become a reality. In just the past 7 days, the following reports demonstrate the accuracy of yet another Zeta prediction heralding the return of Planet X.
Richard Black, of Farnhamville, shows the dead grape shoots that followed last week’s three nights of freezing temperatures. Black said the damage is “severe” and estimates at least 75 percent of his crop was ruined. "I estimate the damage at anywhere from 80 percent to 100 percent in fields and orchards where the hail struck. The fruit and nut trees were stripped bare. The trees look like they are in midwinter and haven't even budded yet." "I've been doing this pretty much all my life. It's been here 130 years in the family, so I'm the fourth generation, so it's our livelihood," he says. Robertson says he's been worrying about his trees, which he expects will produce about half the cherries they normally do this year. Southwestern Michigan grape growers are reeling from last week’s freezing temperatures that seem to have wiped out the majority of this season’s grape crop. “This is the worst situation we’ve had. ... This is devastating for southwest Michigan growers,"
"It's essentially almost a total crop loss this year," said apple farmer Mike Perbix. Perbix owns Sweetland Orchard in Webster. He says he has lost more than 90 percent of his apple crop. Recent early morning frosts and the ongoing drought, have led to an almost total loss of production in a number of fruit and vegetable farms across the Algarve. The overnight lows left some blueberry farms with plenty of damage during a season that had been expected to be the best in years. Some farms saw up to 90 percent damage to their crops. Cold temperatures Wednesday night caused widespread damage to fruit crops across Henderson County. Apple trees bloomed two weeks early as a result of the mild winter, and that left them vulnerable to cold temperatures. FARNHAMVILLE - Richard Black said he knew the killing frost was possible, even to be expected, but some part of him was hoping it wouldn't happen. But it did. Last week, with the first primary grape buds out and a month ahead of schedule, temperatures dipped at official measuring sites to 29 degrees and to 24 degrees on Tuesday. Twenty-eight degrees for four hours is considered a hard frost in farming terms. But according to Black, his thermometer read 17 degrees overnight on Monday, 16 degrees overnight Tuesday and and in the 20s overnight Wednesday. That was enough, he said, to cause significant yield losses to his grapes, especially his early budding varieties. "It was bad," Black said, who manages 1,600 grape vines in a 3-acre site around his rural Farnhamville home. "It was devastating." When told that Mike White, Iowa State University's viticulturist, estimated the statewide grape yield loss at 50 percent, Black said, "That would be good news. But Mike is looking at the entire state." According to White, vineyards north of I-80 were frost-bit more severely than those in southern Iowa counties. Some growers attempted to keep heat among their vines, or continually spray water on their vines, and some tried spraying liquid potassium, which acts like an antifreeze to protect the buds during the freezing period, White said. Black didn't try any of those measures. "There's not a whole lot you can do," Black said. "Most efforts are not effective. "The most you can do is give the vulnerable buds a 3- to 5-degree protection." Once the temperature slips to below 25 degrees, all bets are off. "And it's not like flowers; you can't just throw a blanket over them," Black said. "And we're not the only ones; the same happened to orchards too." He said the primary buds of Marquette varieties were out to 3 inches long on Sunday. They looked green and lush. Some of the secondary buds were out, as well. White and Black both said frost damage varies by cultivar and location. Early budbreak varieties, including Marquette, and low-lying areas normally receive the worst damage. Black said before the frost, "It would be easy for someone to get overly optimistic. You look at the (vines) and think here's a chance to do a really good job by the book all season long. "And well, here we are ..."
Black fully expects to see a 75 percent yield loss on his grapes. "But we'll be able to tell better in about two weeks," he said. He hires three workers throughout the growing season to tend his vineyard. Are they out of work now? Not at all, Black said. Half of all the work on vine husbandry is for the current crop and half is for the next year's crop. "The crop is gone," he said, "but we still have to do everything as if it's otherwise, only there's no income coming in." Crop insurance on grapes? Forget about it, Black said. "There is insurance, but you can't afford it," he said. The reason is that, unlike corn and soybeans, the sheer numbers of growers are not sufficient to share the risk, so insurance rates are high on grapes. According to White, there are only 300 Iowa vineyards, cultivating grapes on 1,200 acres statewide. "This frost did not kill any vines," White said. "It only set us back. The industry will continue to grow." Disappointed about the frost damage and the lost yields, Black said he tries not to get too down. "I'm not the only one this happened to." Ajay Nair, an ISU Extension vegetable specialist, said he noticed damage to fruit blossoms at the Horticulture Research Station near Gilbert after the April 10 frost and temperatures were even colder April 11. Paul Domoto, an ISU Extension fruit specialist, said the temperature dipped to 20 degrees at the horticultural station, a temperature that damages plants, but especially those near the ground, like strawberries. Strawberries are most vulnerable at bloom, however, only the earliest cultivars have reached this stage of development. The problem with the fruit crops is that the early spring weather sped up blooming, which is a particularly sensitive stage for the plants. Domoto said although there has been damage it's too early to say how bad the freezes were until growers can assess the conditions in their areas, because site conditions and stage of bud and/or shoot development will have a significant influence on the extent of injury. Nick Howell, superintendent of the Horticultural Research Station, doesn't expect much of an apple crop because of the freezes. He confirmed there was "significant damage" to the station's vineyard and strawberries. Apple trees typically are "in jeopardy" until the middle of May, he said. Unfortunately, Howell said the expense of pest management in the apple orchard must be maintained even though there are few, if any, apples produced. A series of freak April storms hammered the San Joaquin Valley last week, damaging vulnerable crops with a one-two-three punch of hail, lightning and tornados that caused millions of dollars of crop losses. It will be several weeks before an accurate tabulation of losses can be made, but for some growers it amounted to 100 percent of this year's production. A number of crops suffered damage from the unrelenting power of hailstones measuring 1.5 inches in diameter or larger. Nature's fury came in the form of "supercells"—large thunderstorms that moved slowly across the valley from Kings County, through parts of Tulare County, up to Merced County and all the way eastward to Mariposa County. The most destructive storm brought torrents of hail across a six-to-eight mile-wide swath of farmland that extended some 30 miles, accompanied by thunderstorms and numerous lightning strikes. The epicenter of the more significant of two supercells last Wednesday was in Tulare County near Traver. Grower Ed Needham, who was caught driving near Traver when the storm struck, described it as "the sound of someone hitting my truck with a hammer." Needham said he was in his truck with two other farmers and had pulled over to watch a huge storm cell to the south when the other cell struck from the north. "It started out small and was no big deal and then all of a sudden the side-view mirrors on my truck shattered and the road started getting covered with huge hailstones. I looked at the wind and saw that it was going south, so I took off and went to the south and got out of it," he said. Steve Johnson, a storm chaser with Atmospheric Group International, tracked the storms closely and estimated that the damage to agriculture could reach $25 million or more just from the two supercells that hit last Wednesday afternoon. "While other thunderstorms were moving at about 25 miles per hour, these two slugs were moving at about 7 or 8 miles an hour, so they just trudged along producing very large hail and a high quantity of lightning," he said. "I estimate the damage at anywhere from 80 percent to 100 percent in fields and orchards where the hail struck. The fruit and nut trees were stripped bare. The trees look like they are in midwinter and haven't even budded yet." Johnson also reported that a third supercell formed over farmland west of Lemoore, producing a tornado, and another one popped up near Huron, causing considerable crop damage to Westside lettuce and tomato fields. The following day, a supercell formed in Merced County near Dos Palos and moved northeast between Atwater and Merced, once again accompanied by huge hailstones. "The hailstones were larger than those on the previous day. There was 1 3/4-inch hail that was recorded near Castle Air Force Base, causing a lot of crop damage as well as other damage before moving up into Mariposa County," Johnson said. John Diepersloot, one of the owners of Kingsburg Orchards, which grows peaches, plums, nectarines and apricots, said the storms wiped out some orchards while leaving adjacent ones unscathed. He said several of his orchards were struck and that while the visible damage is obvious, it will be several days before any accurate assessment can be made. "Where the hail hit, it is a complete, 100 percent loss. It was hitting in cells, so one area was a complete disaster and another area got missed," he said. "Some of the fields look like they got beat up pretty bad. Most of the apricots, cherries, pluots and plums got scratched up pretty bad or even knocked off the trees." Diepersloot also noted damage to other crops, particularly grapes and newly transplanted processing tomatoes. "The tomatoes on certain blocks were stripped down. The transplants had leaves ripped off. The grapes had everything from tender, new shoots to the bark itself torn off. A lot of guys are planting their corn, but it isn't up yet, so that is still in the ground," he said. John Thiesen, general manager of Giumarra Brothers Fruit Co. of Reedley, said he is still trying to assess the losses, and that enough fruit to fill from 5 million to 12 million boxes may have been lost. "That is a pretty big span, so no one really knows for sure. But we do know there is very significant damage," he said. Thiesen said the magnitude of last week's hailstorms was stunning. 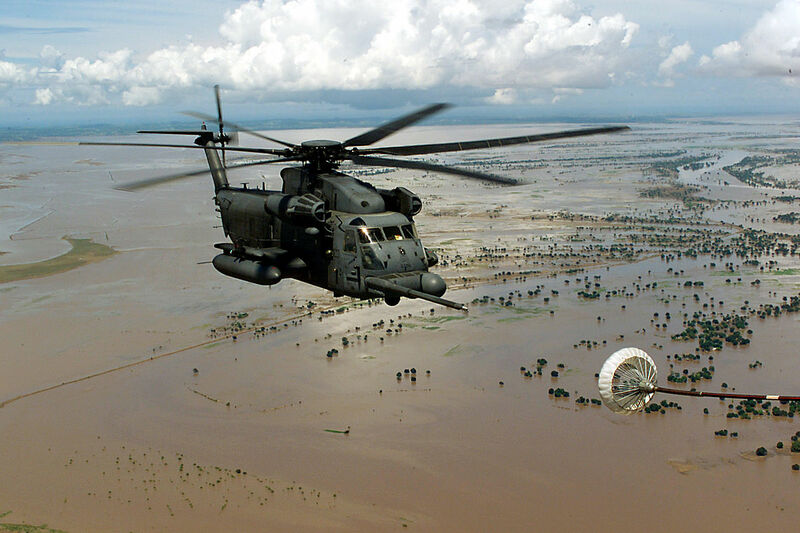 "One doesn't see this kind of devastation very often. I know for us here, we were fortunate to escape, but the emotions are such that we feel just awful for all our grower friends who were affected. It is heartbreaking," he said. Michael Miya, who farms walnuts, pistachios and field crops such as wheat, corn and onions for seed north of Hanford, said this was the worst hailstorm he has ever witnessed. "We inspected the damage to our walnuts and it chopped a lot of the young leaflets. It covered the ground in green where the hail went through. We are concerned with the nuts that are already set on the trees," he said. "Some of my neighbors with almonds say they lost about a third of their crop, some less and some more, depending on where they were located. One of my neighbors with cherries said he has probably lost 80 percent of his crop." Johnson, a severe-weather specialist who provides private weather forecasting for farming operations, utility companies and irrigation districts in the San Joaquin Valley, said it has been at least 20 years since something this severe struck the region. "I feel really bad for the farmers who have been annihilated, because they work very hard," he said. For many, Door County cherries are a Northeast Wisconsin tradition. But for Kris Robertson, the owner of Robertson Orchards, they're so much more than just that. "I've been doing this pretty much all my life. It's been here 130 years in the family, so I'm the fourth generation, so it's our livelihood," he says. Robertson says he's been worrying about his trees, which he expects will produce about half the cherries they normally do this year. That's because our unusually warm March caused the buds to start developing about a month early. And now with the chilly weather and overnight freezes, some are already damaged. "Oh yeah, there's a lot of blossoms I open up. The pistils are black, which shows that they should be dead so they're not going to bloom," says Robertson. UW-Madison agricultural researcher Matt Stasiak says this a common problem for Door County cherry growers this season. He conducted a sample study a few weeks ago. "We looked at, as we do every winter, a number of buds and we were seeing a fair amount of damage, the average was about 70- to 75 percent of flower buds were damaged," says Stasiak. Stasiak says we won't see the full impact of this inclement weather until harvest in June. In the meantime, cherry growers like Kris Robertson will be getting a lot less sleep. "Oh, it keeps you up at night worrying, but there's nothing you can do. You just have to hope that the weather changes and you get some crop out of it," says Robertson. It’s not sour grapes, it’s fact: Southwestern Michigan grape growers are reeling from last week’s freezing temperatures that seem to have wiped out the majority of this season’s grape crop. Although fruit growers in Berrien, Cass and Van Buren counties are still assessing the damage, it appears that virtually the entire grape crop grown for Welch's Foods in southwest Michigan has been lost. Unusually high temperatures at an unusually early time made the plants bud early, making them susceptible to temperatures that dipped into the 20s. John Jasper, area manager with the National Grape Cooperative Association, which owns Welch's, oversees 250 farmers and 12,000 acres. Of those farmers, he said, more than 90 percent of their primary buds died. There’s a “glimmer of hope” for some secondary growth to push out a little later but as Jasper pointed out, for most farmers that’s not going to pay the bills or perhaps even make it economical to harvest the few grapes that are left. “This is the worst situation we’ve had. ... This is devastating for southwest Michigan growers," he said. According to Jasper, Welch's gets about 17 percent of its grapes from the area, perhaps prompting the company to change recipes for some of its products. At Bixby Orchards in Berrien Springs, Patricia Bixby said the damage was similar to a 1997 hailstorm that also wiped out the farm’s grape crop. Cherries, she said, “don’t look too bad,’’ adding strawberries will be OK thanks to irrigation that insulated them against the 29-degree cold. As for apples, she said, she and her husband Paul might lose 75 percent of their crop. 'You just go on,' she said. The news was better at the Lemon Creek Winery where Jeff Lemon, a business partner and wine maker, said 140 acres of wine grapes offer enough varieties, and in such a wide range of development, that all won’t be lost. “Some of the buds were still pretty tight. Those came through a little better,’’ he said. The farm also features peaches, apples and cherries, with apples taking the biggest hit of the three, he said. At Round Barn Winery in Baroda, wine maker Matt Moersch said he expects some of the younger varieties of grapes will have a 40 to 60 percent loss but older varieties may lose just 10 percent. Retails prices for the winery’s wines shouldn’t be affected this year but could go up in 2013, although not dramatically, he said. At the Tree-Mendus Fruit Farm in Eau Claire, Herb Teichman said the few grapes he grows for personal use are “in good shape’’ but some varieties of apple trees didn’t fare as well. “With some (apples), there was very little (damage) but some others were quite serious,’’ he said. Tart cherries also had some damage but Teichman said he’ll still have a crop to harvest. “It’s a reduction but not a wipeout by any means,’’ he said. Federal government relief could be forthcoming for some grape growers, most likely in the form of low-interest loans. U.S. Rep. Fred Upton, R-St. Joseph, is on record stating grape growers deserve relief. The apple crop at Kercher's Sunrise Orchards in Goshen was also heavily damaged, the owner said Sunday. The warm weather we saw recently back caused many of his apple flowers to bloom. But then this week's freeze left them uncovered and unprotected. "You open it up and all you see is black right in there. And you can tell that's not going to produce anything viable," said Perbix when he opened up a flower bud. That brings us to the consumer side of this story. What does it mean for those who like to eat an apple a day? The short answer: it is still too early to tell. "Our producers, they're really just beginning to understand what happened to them," said Gary Johnson with Valley Natural Foods in Burnsville. There are two ways consumers may be affected if this wacky weather continues. First, experts believe there is a good chance the local selection will not be as good. "So what they might find is more apples are coming from out state. You may see more apples come in from Washington for example," he said. The second way this year's apple crop may bite consumers is at the checkout counter. Prices may go up. However, at Valley Natural Foods, their apple producer has not seen a problem with its crop yet. "They're going to provide apples to their whole sale partners at last year's prices," said Johnson. David Bedford is a researcher and apple breeder with the University of Minnesota. He says he has never seen the apple crop start so early in his 32 years of breeding. "It's very unusual," he said. "But we're not in disaster mode yet." He says most crops only need about 15 percent of the flowers to produce a healthy amount of apples. Typically, apple flowers come out of dormancy around May 15; this year it is at least a month early. "We should know more in three weeks," he said of the extent of the apple crop damage. Back at the orchard in Webster, Perbix knows where he stands. His apple money is all but gone for this year, thankful his wife is not in the family business. "The best insurance policy is that my wife works off the farm," he said. The Association of Farmers of Faro and Surrounding Councils, which represents the majority of fruit and vegetable producers in the region, has said it is unhappy with government measures announced on Monday, adding that some of its members are on the verge of bankruptcy and despair. 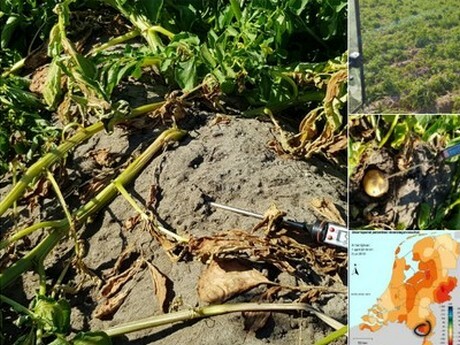 The drought impact is confirmed by an official report dated March 13th, which states a 50% loss of greenhouse vegetables in the Algarve - especially in Faro and Olhão. The report highlights the losses caused by frosts in the greenhouses to tomatoes, peppers, cucumbers, beans and melon. in addition it says that open air crops such as broad beans, peas and potatoes have been affected. In relation to citrus fruit, the report says that the fall in production is "significant." "I have lost 80 percent of my tomato plantation, which corresponds to a total loss because no one is going to water and pick the remaining 20 percent," said 44- year-old Paulo Cristina, who has six hectares of greenhouses on the outskirts of Faro. With 120 tonnes of tomatoes lost, and with the selling price of tomatoes at 45 cents per kilogram, he calculates that he has lost €54,000, corresponding to half a year’s work. Mr. Cristina awaits EU funds that have been promised by the Ministry of Agriculture, but says he is angry about the lack of available insurance to cover such events. Similarly, the President of the Regional Agricultural Association, Ana Lopes, laments that insurance companies don’t provide policies adapted to each region, as "each area of the country is unique and has its own agriculture." Local farmers said the combination of warm winter months with the recent frosts was too much for certain varieties of blueberry bushes to handle. The more advanced the blueberries are, the more that is at stake when a freeze warning goes into effect. Cold temperatures Wednesday night caused widespread damage to fruit crops across Henderson County, according to Marvin Owings, county extension director. "And we still have tonight," Owings said Thursday, referring to a freeze watch in effect through today's predawn hours. It will be a few days before growers can assess the extent of the damage to their crops, he added. "It is almost impossible to determine how bad it is the day after a freeze," Owings said. Temperatures Wednesday night and Thursday morning fell to between 25 and 28 degrees in some areas. Temperatures 28 degrees and below can impair the fruits' growth cycle, Owings said. Apple trees bloomed two weeks early as a result of the mild winter, and that left them vulnerable to cold temperatures. "They are in full bloom, and that is the most critical stage of development," Owings said. Farmers will check today to see whether Thursday night's temperatures caused more damage. The National Weather Service was forecasting a low around 32 degrees. Henderson County grower Kenny Barnwell said Thursday that frost had ravaged his 10 acres of peach trees in Edneyville. "They were hurt pretty bad," Barnwell said. "I saw a lot of dead peaches." His apple crop also was affected. "A couple varieties (of apples) were severely damaged," Barnwell said. Peach and strawberry growers in Upstate South Carolina reported that their crops had not been affected by the cool overnight temperatures, and some farms in Henderson County were spared. "So far (the peach crops) are OK because the peaches' blooms have come and gone on most varieties," Danny McConnell said. On Thursday, McConnell said it was too soon to tell whether the cold had impacted his apple trees in Dana, but he expected them to be fine. It takes about 24 hours after a cold night to notice any damage to the apple blossoms, McConnell said. Local strawberry growers said they were taking precautions to protect the soft fruits. J.D. Obermiller had a long night Wednesday as temperatures dipped into the upper 20s at his strawberry farm in Horse Shoe. He started the irrigation system at 2 a.m. to protect his crop, and by 10 a.m. Thursday, the last bit of ice melted off the strawberries. "The berries look good," Obermiller said. "The blooms look bright and shiny." McConnell kept his strawberries covered with plastic to protect them from freezing temperatures, but he planned to uncover them today because warmer weather is in the forecast. High temperatures are expected to be in the 70s and low 80s this weekend, with lows between 40 and 55 degrees. As he waited out the freeze threat on Thursday, Obermiller was hoping for minimal frost exposure, but he was prepared. "If need be," Obermiller said, "we'll sprinkle them again." According to satellite data that was just released by Reuters, “at least 1 million acres of U.S. farmland” were covered by water for at least seven days this month. That is an agricultural disaster without equal in modern American history. 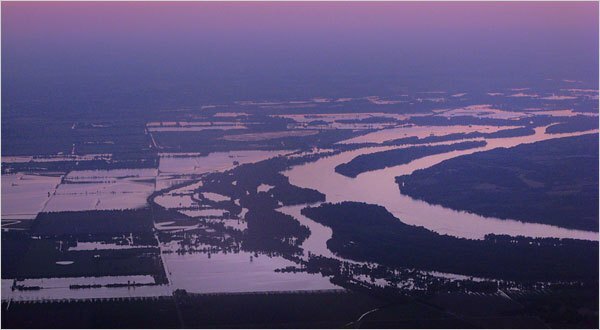 Farming communities all over the central part of the nation now look like war zones as a result of all this flooding. And with more flooding on the way for the next two months, this crisis is only going to get worse. "It's unprecedented. Never, never before have I seen this in my time," said Kevin MacIsaac, general manager of the United Potato Growers of Canada (UPGC), an organization that provides industry information to help farmers make production and marketing decisions. He's been with the organization for seven years and, before that, grew potatoes in Prince Edward Island, where he still lives. Farmers abandoned about 16,000 acres of potato crop, according to the group's most recent estimate, which did not include figures for Saskatchewan, Ontario or Nova Scotia, but indicated they also suffered some losses. B.C. is the only province that did not mention abandoned crops in UPGC's report. P.E.I., the country's largest potato producer, suffered the most. Farmers left about 6,800 acres unharvested. 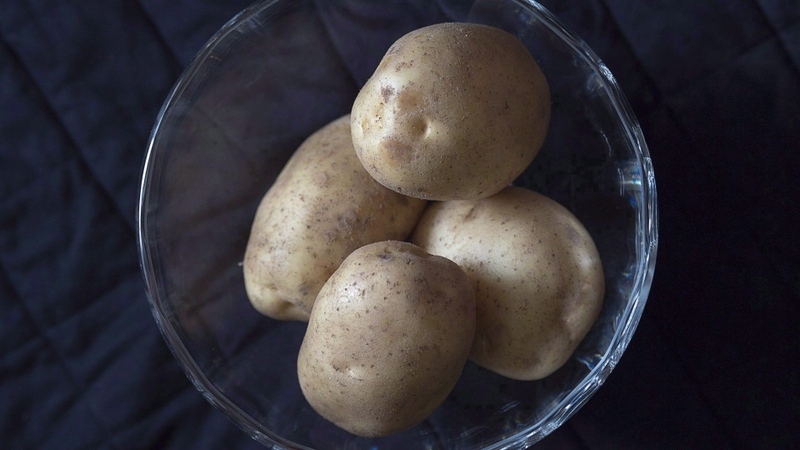 In a typical year, some 500 to 1,000 acres may be abandoned, said Greg Donald, general manager of the Prince Edward Island Potato Board, which represents the province's nearly 170 growers. "Many have described it as the harvest from hell," he said. In Manitoba, some 5,200 acres remain unharvested, according to UPGC. While the province's prospects for a good yield were strong going into harvest, rainfall followed by a cold spell resulted in thousands of abandoned acres, said MacIsaac. Most farmers will have some type of insurance to cover a portion of their costs associated with the lost income, but it won't cover the profit they would have made, he said. "It's going to be a real, you know, challenge," said Donald, adding there's not going to be enough local supply for the markets the province typically serves. His province abandoned about 1,000 acres, he said, which is more than he'd like, but pretty typical. It was able to send some potatoes to P.E.I. and Alberta to help, he said. "Overall, I think the crop is going to be tight, but I think the industry will be alright." When there's less of a product, it's going to be reflected in the price, Donald said, adding even the potatoes that have been harvested are not quite safe yet. "So that's still a big concern as well." 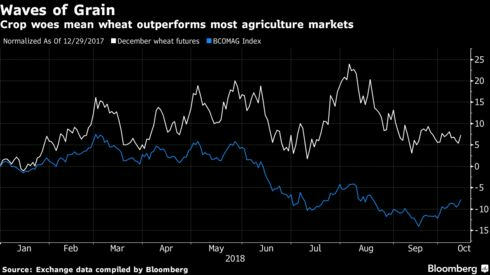 The global wheat issues drove December futures in Chicago up 7.3 percent this year to close at $5.1725 a bushel on Friday. It’s a similar situation in neighboring Alberta, where 47 percent of major crops have been harvested, trailing the five-year average of 82 percent, the province’s agriculture ministry said Friday in a report. 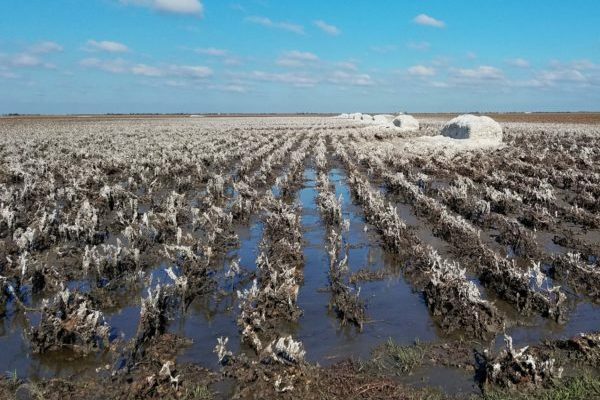 While it’s too early to make specific damage calculations, the storm hit North Carolina with nearly all of the state’s 420,000 acres of cottonand 100,000 acres of peanuts still in the field. The cotton damage is unknown, but peanuts may manage while still in the ground. Crop failure increasingly evident around the globe this year. In large parts of Germany, there is currently talk of a protracted dry spell and relatively high temperatures. For now, this is not causing any major issues. The heat has a positive, rather than negative effect on a large number of products. Yet, an increasing number of producers and traders are voicing their concern about the current climate conditions: in the Lüneburger Heide region in the in the state of Nedersaksen - Germany's main potato supplier - the farmers are realising that their time is almost up. The artificial irrigations systems have been working at full capacity there for weeks now. There is also no talk as yet, tof large-scale problems. However, if the drought continues for ten to 14 days, the consequences will be enormous. Part of the harvest will, undoubtedly, be lost. Unfortunately, not a drop of rain has been predicted for the coming days. After the “Future of Pāhoa” town hall meeting on June 30, 2018, Big Island Now was given the opportunity to travel to lower Puna with a state legislator and a papaya farmer to view fields and the impacts on the farm. The hour-long ride to the farmer’s land traveled through one checkpoint and several gates on multiple properties to get. The roads have been cut off and this—the long way—was the only way in. This video was taken from what used to be papaya fields, until lava flows came through about three weeks ago. The farm was previously also growing banana, soursop, oranges, macnuts and more. The papaya fields are now covered by lava and directly adjacent to a river of lava. The owners of this property are still harvesting fruit but no longer live on the property. Hawai‘i Island has so far lost 80% of its papaya farms. Fissure 8 is erupting 26,000 gallons of lava per second. USGS said the channelized flow was moving at an average of 17 mph. Trade-winds are blowing the emissions to the south. In the last few days, six homes have been taken by the lava, in addition to last week’s official count of 657. The Fissure 8 flow has stabilized but shows no indication of stopping anytime soon. Pavel Tordaj, 42, a farmer, shows corn damaged by drought as he stands inside his field of corn in Padina, Serbia, Thursday, Aug. 10, 2017. Authorities and experts are warning that extremely hot and dry summer this year in the Balkans has decimated crops, dried rivers and hurt the animal world. BELGRADE, Serbia — Evidence is piling up that this year's sizzling summer in central and southeastern Europe has decimated crops, drained rivers and hurt the animal world. As the drought's costs become clearer, temperatures in Serbia, Romania, Hungary and Croatia soared to nearly 40 degrees Celsius (104 Fahrenheit) again on Thursday following a few days of moderately less oppressive heat. The region is enduring one of the hottest and driest summers in years, during which several people have died and dozens of wildfires have flared. The drought has also ratcheted up demand for water and electricity. Serbia has been one of the hardest hit countries, with experts saying an estimated 60 percent of corn crops destroyed. The ministry of ecology also says water levels across the country have dropped drastically, threatening fish stocks. "This is really sad!" said farmer Pavel Tordaj from the northern Serbian village of Padina, while showing withered corn and scorched sunflower on his land. Tordaj said nearly all his corn, and half of his sunflowers have been destroyed by the drought, adding that it will be very hard for the farmers to make up for the loss. "Who will pay for that?" he asked. "We took loans from the bank." Corn accounts for around one million hectares (2.4 million acres) of Serbia's farmland, which is widely perceived as having a poor watering system. Overall, around 60 percent of corn crops have been destroyed, according to Zeljko Kaitovic from the state-run Maize Research Institute. "Unfortunately, extreme drought conditions caught the corn in the most sensitive phase of development," he said. "Not even heavy, longer rains could help now." 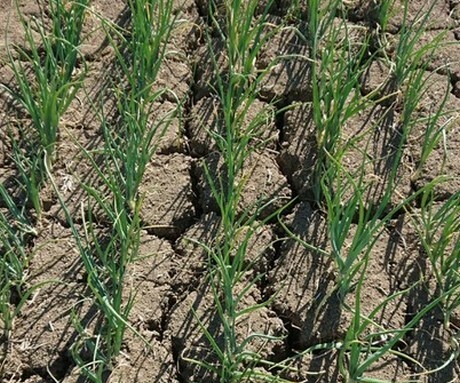 Serbian government officials have said any shortages following this year's drought will be covered from state reserves to avoid further damage. The government has also urged consumers to be cautious with water usage and factories to refrain from depositing waste into drained rivers where the fish are already suffering. In neighboring Hungary, the drought has reduced the number of birds hatching in a national park as many of the breeding areas have dried out. Preliminary state statistics have shown a predicted decline in Hungary's grain harvest of around seven percent. Rising temperatures have also prompted Hungary to set a stricter legal definition of what constitutes a drought, which will make it more difficult for farmers to get compensation from insurance companies. In the country's Koros-Maros National Park, the majority of stork nests observed this year had only three young birds instead of the usual four and none had more than five. Many of the nests had only a single nestling. In the Czech Republic, authorities said farmlands in the southeast of the country have been most affected amid predictions that the corn harvest could fall by more than 50 percent. In many Czech rivers, the water levels have been about 25 - 50 percent lower than the long-term average, a development that's prompted authorities to ban the use of river water for gardens. 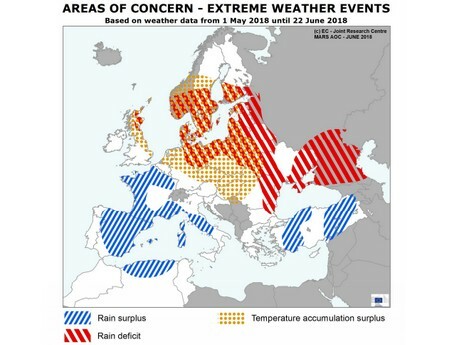 Meanwhile, in Romania, experts from the country's Academy of Agricultural and Forest Science were holding a conference Thursday on how the weather changes are affecting the crops. The academy said earlier this year that hot temperatures in recent years had killed off fruit trees and vines, including apple, pear, plum, cherry, apricot, peach and walnut trees.